We're right in the middle of March Madness, which means we'll be watching a lot of CBS (and after the games, ESPN) in the near future. With this in mind, I figured that we needed a little guide for watching the tournament. So who better to talk to than the #1 authority on all things TV sports, Awful Announcing's Brian Powell? Brian started his website in 2006, and in that short amount of time it's risen all the way to #3 on the Ballhype charts. Yes, Awful Announcing has indeed struck a nerve with the TV-watching, blog-reading sports fan. AA has enough embedded video clips and screenshots to make your head spin, and as Brian will point out, there's always plenty of Erin Andrews references, for those of you into that. It's a highly enjoyable website. I see that we'll be getting the team of Gus Johnson and Len Elmore for Pitt's Denver region. The equation of Gus Johnson + high altitude = what? Hopefully a few upsets and at least one buzzer beater. Gus seems to have the golden voice when it comes to calling epic Tourney games. Let's just hope for your reader's sake that one of those isn't Oral Roberts. 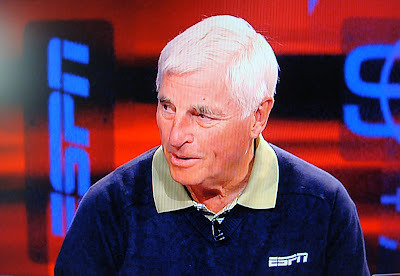 Bob Knight picked the Panthers to win the whole thing. Is that a wise choice from a coaching legend, or the ramblings of a crazy person? I don't think it's necessarily a bad omen, but I had one rule when picking teams coached by Bob Knight. Never pick them past the second round. He's a great coach but later in his years his defensive minded teams just couldn't keep up with the game's new style of play. This Pittsburgh team reminds me of those old Hoosier teams that get it done on the boards and down low and that will either get them very far or not far at all. Which personalities are you least looking forward to watching/listening to during the tournament? Gus Johnson, Len Elmore (I need to give him another chance after the JB debacle last year), Jay Bilas, Seth Davis, and newbie Carter Blackburn. How much time will you spend watching NIT games? Well I spent one night watching my Terps win in Minnesota and I think that'll be about it. I'm actually more interested in the matchups in the CBI this year. I realize that most of your time is spent watching sports. Any favorite non-sports programs you take a break to watch? Finally, the questions we're dying to know: who's going to win it all, and what do you foresee for Pitt? I have Pitt getting knocked out by Memphis but that game could go either way. I just think Memphis' guard play will win out over the inconsistent Ramon. Fields will be everything to Pitt in that game and the Tournament and if they win that game look out. Any team in the bottom half is going to be in trouble. As if the MSU player dribbling off his foot and hitting a three didn't get you....or the Dejuan Blair "moving pick"....the charge by Levance was enough to make me leave the bar where I was watching the game. The officiating is no better than the NHL. In fact, on some nights, like this one, it's even worse. This is a good interview but this guy is wrong on Gus Johnson. Yeah, he's cheesy and maybe a little too excitable, but at least it seems like he enjoys his job. I actually like watching games called by Gus, he makes every game seem important, which if you are a big fan of the teams, is exactly how you feel. i agree. i only want to hear gus, verne, or raftery during march madness. nantz announces every event like it's the masters. get excited, jim!